The magnificent islands of Sydney Harbour. Originally there were 14 : two were joined to form the present Spectacle Island; five - Garden, Bennelong, Darling, Glebe and Berry - were connected to the mainland. The others, which are still islands, are Shark, Clark, Fort Denison (Pinchgut), Goat, Cockatoo, Snapper and Rodd. 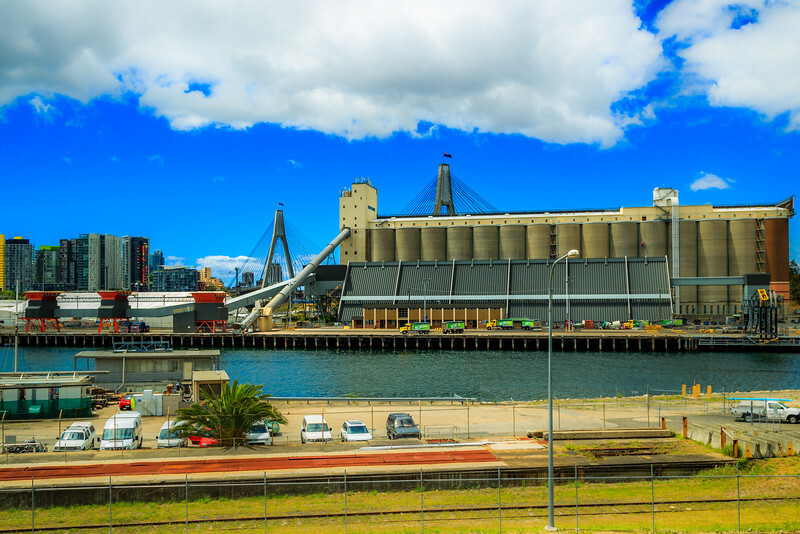 Glebe Island Grain Silos, on the former Glebe Island (joined to the ‘mainland in 1918). Constructed 1921, operated by the Grain Elevators Board of NSW (now part of 'Graincorp'). In 1990 the wheat terminal was transferred to Port Kembla and the wharfage remodelled for containerised cargo. Several of the disused silos were demolished in 2000. NB : the entablature above the silos - for advertising - was added in 2000, in the lead-up to the Sydney Olympic Games.